Friendship Day is the time to express our appreciation for our friends and show them what they mean to us. It is also the occasion to be close with your friends and have some fun with them. And throwing a party provides you with a splendid opportunity to do just that! Parties are the perfect place to let your hair down and indulge in a whole lotta fun and enjoyment. But planning out a Friendship Day Party is not quite a cakewalk. The venue for the party, the time, ways to party, ways of invitation and all the stuffs for grub has to be decided upon. That's why, here, at TheHolidaySpot, we provide you with some great ideas to assist you throw a perfect Friendship Day Party bash. Check them out! If you like them, click here to send this page to whoever you want. Happy Friendship Day! List out the names of all those friends whom you want to invite for the New Year party. Make sure that you send your invitations much before the big night so that your friends can arrange to get some time off to attend your party. Inform your friends beforehand whether it will be a day party or over-night party. You can reveal your ingenuity with the invitation cards but you would do well to relate them with your dominant party theme (though your invitations can also stand apart on their own). Making some funky invitation cards yourself for your Friendship Day party is one nice idea. You can make them funny and attractive by designing them with popular cartoon characters, smileys, or a few good jokes and some nice quotes. Make it as colorful and attractive as possible. The venue of your Friendship Day Party depends as much on you as on your friends. You can throw a party at your shack, provided you are confident you can make all the necessary arrangements for it. If you want to make your jubilations a little different, you can invite all your buddies to watch a movie at the theatre nearest to your home and give them a treat thus. You can also arrange a picnic on the lines of a camp at some good location, one that is safe and nice to spend time at. A theme is one of the prime requirements for any party. The primary thing that should be decided is a theme, so that decorations can be done accordingly. A popular Friendship Day party theme is choosing a particular novel or film and telling your friends to dress up like a particular character from that piece. These days, the most common theme is to dress up like celebrities or in some fancy dress. You can even announce a prize to the best dressed up person. Planning a sleepover party is another great idea. If your buddies are into sports and games, plan up your Friendship Day party accordingly. Arrange for an outdoor match or some fun indoor games with prizes for every participant. But it's all a difficult to arrange and you can all do without a theme if you like. Creating the right ambience for your party is a must for that is what goes on to make the time a memorable one. A brilliant decoration goes a long way to create the right mood and make your party an occasion to remember. 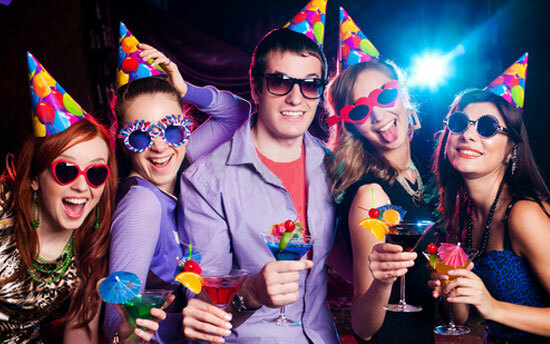 Dress up your party zone according to the theme of the party. To make your party more interesting you can also rent out some movie DVDs. Be it a thriller, a romance, an adventure or an action flick, a nice movie will certainly add to your celebrations. So will some cool music. Be it the golden oldies or the latest melodies, soulful numbers or dance tracks, choose the music for your party with care and make sure that it goes with the taste and preferences of your buds. All said and done, however, groovy dance numbers are the best for occasions such as these and if you have a Dance Party theme, this kind music will jell well with the mood. This is the most crucial part of any party, and Friendship Day Party is no different. If you plan to restrict your party to the daytime, cooking up a meal with the entire gang can always be a good idea, especially if you want to have a picnic. Fill up the picnic hamper with games and goodies and you'll watch just how wild your pals can be! If you prefer to party through the night, a Friendship Day dinner party is quite a smart way to bowl over your chums. Hit your favorite joint with your pals, order what you enjoy the best and savor delicacies like barbecues, lemonades and hotdogs on Friendship Day. If your gang includes vegetarians, make adequate provisions for them. To receive your friends' appreciation, Friendship Day Party Favors will be a good idea. Though it is great to hand out party favors according to the theme of your party, handing out friendship bands is also a nice idea. Friendship bands are favorite items for youngsters and are available in stores all over. Girls can go in for friendship bracelets instead of the conventional friendship wristbands. Give these to your friends as nice tokens of your love and bind them in an everlasting bond of friendship.